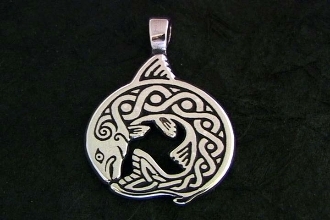 The Salmon was revered as one of the oldest and wisest beings and was involved in many aspects of wisdom in myths and tales involving ancient knowledge in the natural world context. Some of these myths revolved around the wisdom that would be endowed upon the one who consumes the Salmon. It is interesting that the scientific world has explored and confirmed the correlation between the omega complex found in Salmon oil and healthy brain functionality. Science has taken it's time to "catch" up to the knowledge of the Salmon! The Celts had this figured out a very long tiome ago! The design itself is an original concept exemplifying the true eternal nature of the salmon life cycle in Life, Death, and Rebirth. As a former Salmon fisherman in Alaska, Sean's connection to Salmon runs deep, and along with it an appreciation for art styles of the Northwest tribes. This influence did work it's way in to the design, encouraging a cross continental connection to these great and important beings.